A client approached us and asked if we could print some leaflets. He wanted to send some out to his potential clients. Of course, we can do just that, so I quoted to print 1000 doubled-sided A5 flyers. Great. When I looked at the design of them though, they weren’t very inspiring and I didn’t think they would get much return. So, I asked a few questions. How did it go? No responses. Hmmmm…. The answers to my questions made me think “Why would we get a different result this time if we didn’t change anything? ?” The reality is, we wouldn’t, so I asked a few more questions. After another discussion, the client was convinced that if the potential customers actually read the information, they would love it. So the challenge then was standing out, getting seen, being quirky or interesting……basically just getting it picked up and read. We did a redesign so it was more eye-catching. We changed it from a leaflet to a postcard and die-cut it into the shape of a VAN to make it stand out as it was going to Transport Managers. We simplified the text to bullet points so that the message was clear and it could be read quickly. We added a call to action to encourage a next step. All in all, we spent a bit of time thinking about the journey that the customer would make and how they would interact with the material when they received it. With these changes, now the material would get more attention and the chance of it getting read was vastly increased. A week after the print was delivered, my client was back on the phone and thrilled to bits…..
“I sent out the first 100 postcards and have had 24 phone calls,” he said. A 24% response rate. Now that’s not too shabby! 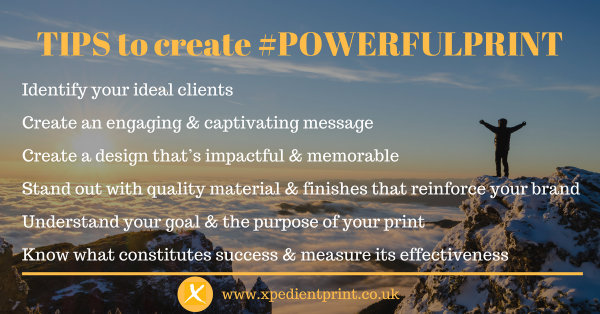 If you need help creating powerful print that makes an impact, feel free to get in touch. We can give you advice on the best types of print materials to use and help you design pieces that will stand out and get you results.